The gospel narratives tell us that the risen Jesus stayed with his disciples for a significant amount of time (40 days!). In the post resurrection narratives of the gospel we find powerful reminders of how we might live the resurrection life in our day and time. Below is an abridged version of the Easter sermon that I delivered at the First Baptist Church of Westfield on April 5, 2015, where the Rev. Mayra Castañeda is senior pastor. Why the sermon title? I even asked myself, Elmo do you really want to have that as the title of your sermon? That is too much violent imagery for Easter. We should be talking about victorious and triumphant things today! We will, but as I reflected on the world around us today - as I normally do when preparing for a sermon - and what the Easter message might speak to this time, I was led to our gospel text today and found it inevitable not to speak about the stab wounds and nail marks of Jesus. 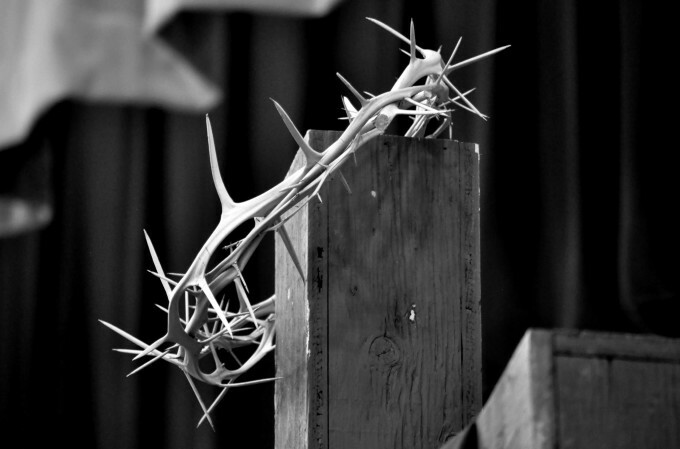 What is so holy about Holy Week? On closer examination of the gospel narratives, many unholy things happened to Jesus this past week. He was mistaken to be the messianic military deliverer for Israel, then sold for a few pieces of silver and betrayed with a kiss by one of his own followers. And when he was arrested one of his own followers driven by road rage violated his teaching on love, drew a sword and cut off the ear of one of the arresting officers. Jesus rebuked his disciple, and healed the ear of that soldier. And then when he was brought to the maximum security prison of the empire and used as political football by politicians and religious bureaucrats - Caiphas the high priest of the ruling religious party, vassal governors Pontius Pilate and Herod who were political rivals even found common ground on Jesus. And then the crowd that welcomed him with palms and loud shouts of hosannas when he entered Jerusalem earlier in the week, now joined all these protagonists who want him dead but no one wanted his blood on their hands. All that Jesus did was proclaim and preach the coming of God’s kingdom of love and eternal life; all he did was miraculously heal the sick and raise a dead friend back to life, welcomed the outcasts of society, and preached forgiveness of sins and announced indestructible hope. Yet contrary to all evidence, a kangaroo court accused him of trumped up charges of sedition, terrorism, conspiracy to overthrow the religious leaders of the temple, fraternizing with sinners and blasphemy against the divinity of Caesar - enough charges to set the pretext for his brutal torture, his humiliation. They stripped him naked, mocked at the claims of his divinity by wrapping him in cloths of royal color, but then ramrodded a crown of thorns on his head as they laughed with glee and derision. Jesus, who scripture prophesied as the coming Messiah, God with bones, muscles and sinew - God in the flesh, love incarnate - died in unspeakable pain, gasping for air as his lungs collapsed. Then his friends abandoned him, the MVP of the disciples even denied knowing him. Only the women stayed. Nothing holy happened during that week! In this proclamation I am reminded that in the resurrection of Jesus, all our politics, all our theologies, all our ideologies, even all our Christianities - now stand under scrutiny and judgement to this Jesus! We still live in a broken world, a time when many great evils continue to walk the earth. Cults of death, sadistic, genocidal and murdering hordes remind us still of the depravity of sinful humanity. The poor and the powerless continue to be oppressed and exploited by rapacious economics and unjust systems all over the world. Thomas’ desire for proof brings us to a very important theme of the Easter message. The Roman empire used crucifixion as it primary mode of execution. The brutality and violence of this mode of killing was unspeakable, and the Roman empire had already executed tens of thousands of people during the time of Jesus. Thomas did not want to forget the violence and the brutality that Jesus went through leading up to his crucifixion. He saw Jesus die in that way, and he wanted to see the marks of his death as a condition of his belief. In a way, Thomas was thinking, my Jesus does not have a big “S” written on the robe of his chest. My Jesus had the marks of hate and brutality on him - crown of thorns, lacerations and bruises of torture, stab wounds and nail marks. And so we cannot uncouple the inseparable link between the Bible and the wounds of the world. The passion of Jesus is eternally connected to the passion of the world. The saving divinity of Jesus is inseparably linked to his humanity, his wounds. To follow the way of Jesus is to follow his suffering in the world. What meaning would the Easter message bring in light of the present darkness of the world? Following Jesus requires us to walk in the way of the cross. Loving Jesus requires applying such love into action. “Do you love me?”, the risen Jesus asked Peter three times. Each time that Peter answered “yes”, Jesus didn’t just reply, “Oh, that’s just cool!” Jesus connected it to action, “Then feed my sheep.” Jesus’ last words to Peter remind us that to love Jesus means to open ourselves to the plight of others, that living for others is where we find the life of the Spirit. It calls us to live for others in a world that usually encourages us to only look after ourselves. There is no other way to walk with God. God chose to come in suffering love through Jesus, that God may enter the reality of humanity’s existence in all of its dimensions, its heights and depths, including death, that our redemption and transformation may also be complete. There are yet many forms of death in our time longing for resurrection. People in the world are still being enslaved, and many live with violence and brutality, thousands of children and infants dying of hunger and preventable diseases. Much war and hatred in the world still destroy life. We also know that many parts of our planet are dying – disappearing animal species, decimated forests, polluted rivers, air and water. We see the urgent need for resurrection everywhere. We no longer have the hands and side of the resurrected Jesus to touch. But blessed are those who have not seen and yet have come to believe. We live in the power of the resurrection, in its hope that in the end love and life are more powerful than death. And we are called to live the resurrected life in the kingdom of love here on earth. What does this mean? It means that we fiercely hope in the midst of despair; we act with generosity and hospitality to the different in the midst of prejudice and greed; we defiantly do justice for the poor and the powerless because God’s love becomes visible only through justice and compassion; we resist unjust authority without fear; and we love, we hope, and we forgive extravagantly in the midst of hatred; and work hard for peace in the midst of the idolatrous worship of war. Like Thomas, may we be reminded that the kingdom of love is built on Jesus’ stab wounds, his nail marks. When we continue to rage against the darkness of the world and the nihilistic ideologies of death, we also proclaim, “My Lord and my God!” Death is defeated, we are set free from fear. And like Mary, may we live these days proclaiming, “I have seen the Lord!